I knew there was a reason that I stopped watching the Tangled spinoff TV show. Tumblr and TV Tropes have kept me up on spoilers, just enough that I was convinced to watch a little. YouTube alerted me to a Disney clip. I’m… not sure how I feel. Disappointed. Unsurprised. Speaking of spoilers, we will be talking about them for this article. So keep your eyes out for them. In season two, Rapunzel was traveling beyond the walls of her kingdom to find the Moonstone. She needs it to deal with the rocks, and the mystery of her hair growing back. It turns out that the keeper is Eugene’s father, who nearly convinces Eugene to not let Rapunzel have the stone because it will hurt her. After about a season of running into all sorts of crooks and adventurers like one of Eugene’s ex-girlfriends and a couple that turns people into birds, Rapunzel finally finds the stone. Then her lady-in-waiting steals it and all the power that entails. Writers, I understand you did build-up. You foreshadowed this, and you told us what was going to happen. But I still can’t believe it. Nor can about half the fandom. Cassandra is not my favorite character. 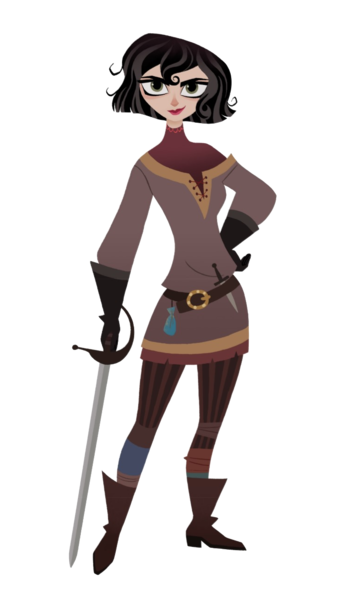 She’s decent enough, being snarky and handy enough with a sword to protect Rapunzel if necessary. But she has layers. Her dad trained her to be a guard but expects her to know lady duties as well. He’s threatened that if she breaks the rules that she’ll be sent to a convent, and he makes good on that promise in the season one finale. Cass is also established as a hypocrite: she hates Eugene for being the former thief Flynn Rider and sees him as an opportunistic gold-digger and rule-breaker. Despite this, Cass has broken the rules when it suits her, to make Cass happy. Thing is that in the original Tangled move, Eugene died to save Rapunzel from Gothel. So the animosity felt unfounded, though they fortunately have worked past the grudge. There are several possiblities for Cass’s betrayal: that she’s an impostor, clone, or brainwashed pawn of a malevolent being. Brainwashed pawn seems the most likely given what’s happened this season where Rapunzel was trapped in a dream where the entire series never happened and she didn’t have responsibilities. According to the Tangled wedding short, Cassandra, Varian, and Lance Strongbow don’t appear. The Stabbington brothers do though. Cassandra is a lady-in-waiting, Varian is an alchemist that befriends Rapunzel, and Lance is Eugene’s best friend and former thief. If anything, given Cassandra was Rapunzel’s lady-in-waiting, she should have been a bridesmaid as well at the least or maid of honor. Varian obviously doesn’t appear after he committed treason in season one, and you all know I cannot forgive what the writers did to him. Cassandra is someone else, though; she has been one of the other women in the story who’s not a straight-up villain and who has gotten a lot of depth as someone who wants to prove herself. She resents that Rapunzel effortlessly steals her spotlight. Even so, Rapunzel loves her, and Eugene comes to respect her. Here is the thing: Cassandra has had these issues as far back as season one. Rapunzel accidentally upstaged her in a Challenge of the Brave, and apologized on realizing what she did. They could have talked this out. So I don’t know what the writers are playing at here. Maybe this will be explained in season three. I’m all for brainwashed Cass and the real one is still trapped somewhere. For now, though, I am annoyed. A bit confused. And wondering why all the new characters have to betray Rapunzel. Can we have one character that stays the same, and there’s a legitimate reason for them to not attend the wedding? Just one. Stay gold, Disney. I hope this is resolved.